NBC10 Boston's Glenn Marshall wrapped up our coverage of the celebration of Boston's LGBT community. Downtown Boston was awash in rainbow flags Saturday as the city's annual Pride parade stepped off. 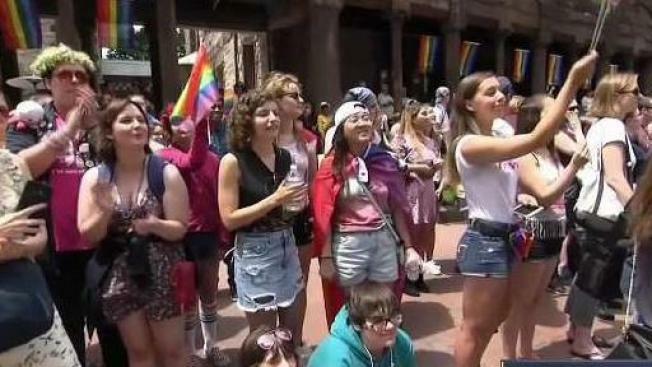 The 48th annual celebration of the LGBT community started Saturday at noon at Copley Square in the Back Bay. It wound through the South End and Boston Common before ending at City Hall Plaza, where a rainbow flag was raised last Friday to kick off the city's Pride Week. Organizers say more than 300 groups signed on for the parade. They said this year's theme of "Rainbow Resistance'' reflects opposition to new and rising threats against the LGBT community. "I have many friends who will get harassed all the time and harassed on the street and they don’t feel comfortable going out -- but they can finally feel comfortable here," explained one parade-goer. The parade brought out both elected officials and entertainers, including Mayor Marty Walsh, Senator Elizabeth Warren and singer and songwriter Melissa Etheridge. Besides the parade, gay-friendly churches downtown and elsewhere also hosted faith services Saturday, and a free concert headlined by Martha Wash, a member of the Weather Girls, took place at City Hall Plaza.